As Secretary of State John Kerry visits the Middle East this week in the hope of reinvigorating the dormant Israeli-Palestinian peace process, he will confront considerable public skepticism in the region about the prospects for peace. Skepticism is especially pervasive in the Palestinian territories. In a recent Pew Research Center poll, 61% of Palestinians said they did not believe a way can be found for Israel and an independent Palestinian state to coexist peacefully. 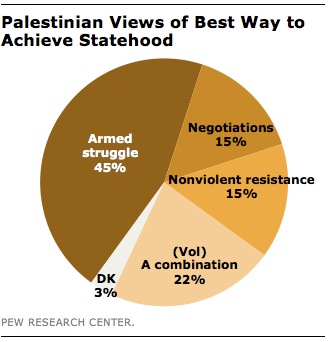 In fact, a 45%-plurality said the best way to achieve statehood is through armed struggle. Just 15% think non-violent resistance is the best strategy. And there is little faith in negotiations – only 15% believe negotiations are the best path to statehood. Moreover, Palestinians feel somewhat abandoned by other nations, especially other Arab nations, in their efforts to achieve statehood. Three-in-four Palestinians say that other Arab countries are doing too little to help with that goal, and many in neighboring Arab nations agree. Most Tunisians and roughly half of Egyptians say their countries are not doing enough to promote Palestinian statehood, although this view is somewhat less common in Jordan and Lebanon. On the other side, Israelis are more optimistic about the chances for a two-state solution – 50% believe Israel can coexist beside a Palestinian state, while 38% disagree. But in the short-run, few anticipate progress. A recent Tel Aviv University poll found that seven-in-ten Israelis rate the likelihood of restarting negotiations with the Palestinians as moderately or very low. The same poll found that kick-starting negotiations is not at the top of the list of Israeli concerns – only 10% suggest it should be the government’s top priority. Instead, Israelis are worried about economic issues and the threat from Iran. Still, there is one hopeful sign for Kerry as he returns to the region this week: many on both sides of the conflict want the U.S. to be more engaged. 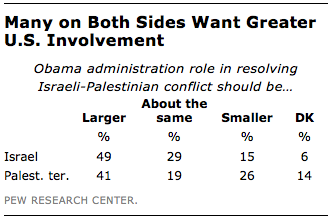 Roughly half of Israelis (49%) want the Obama administration to play a larger role in resolving the Israeli-Palestinian conflict. And even though the U.S. is widely unpopular among Palestinians (they hold a nearly-unanimous view that U.S. policies favor Israel), a 41%-plurality believes the Obama administration should play a larger role; just 26% want a smaller role. So, despite their skepticism about the peace process and their reservations about the U.S., Kerry may find that many Palestinians nonetheless welcome his efforts.